Almost anything can be made into a wrap. When I came across a recipe titled “Tangore Chicken” in my grandmother’s cookbook, “The Art of Good Cooking,” the spices and ambiguity of the titled seemed to lend itself well to a simple wrap. I’m familiar with Tandoori chicken and I’ve even seen a few recipes for Tanjore chicken but I’m not sure where Tangore chicken came from. My guess is that this is a hybrid word my grandmother used for this Indian inspired poultry. This is similar to other ethnic recipes from her book that were so new and different in the 1960’s no one was quite sure of the correct terminology or what to call these dishes. So I decided to re-name this chicken and turn it into a tasty little wrap. When in doubt, wrap it. 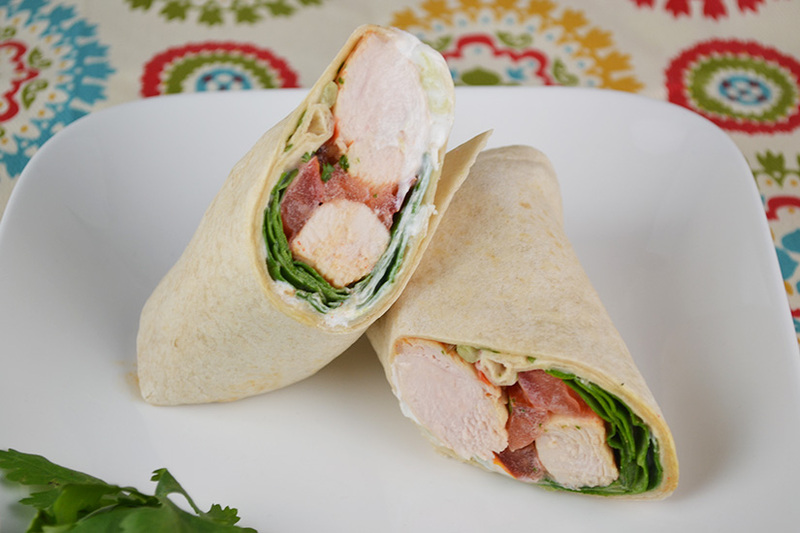 Every good wrap needs a sauce to balance the flavors and textures. For this Indian style version, raita seemed like a natural choice. I’ve referenced raita previously on this blog. It’s my favorite Indian condiment and I almost never eat Indian food without it. So what is raita? It’s simply a plain yogurt mixture. Restaurants often serve watered down versions that frequently include shredded carrot. I prefer a thick raita made with plain (and often Greek) yogurt, shredded cucumber, and a sprinkling of spices such as cumin or mustard seeds. The cucumber not only seems to pair better with the yogurt, it adds to the cooling effect that helps balance spicy entrees. For this wrap in particular, it creates moisture and a light creaminess without adding anything particularly unhealthy. The floral cardamom and coriander give this chicken a light spiced fragrant flavor so that when it is combined with crunchy veggies and creamy raita, every necessary texture is covered. It’s the perfect summer lunch but with a touch of traditional Indian spice. Mix together lime juice, paprika, ground coriander, ground cardamom, salt, stock, tomato paste, and sugar. Place chicken in a shallow dish and pour mixture over chicken. Marinate in the refrigerator for at least an hour, turning the chicken once or twice. Remove chicken from marinade. Place marinade in a wide skillet over low medium low heat. Bring to a simmer. Add chicken and poach for 7-10 minute or until just firm to the touch. Remove chicken and set aside to cool. Place a few spinach leaves in the center of a tortilla, followed by chicken, tomato, and yogurt (raita), and sprinkle with cilantro. Fold in tortilla sides and roll up. Serve with remaining yogurt (raita) sauce.